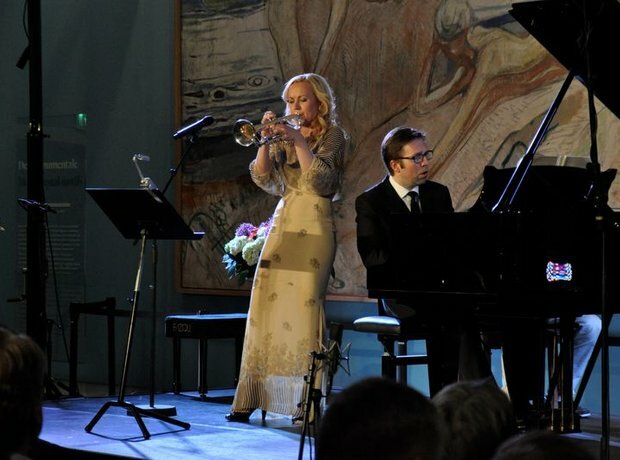 The fantastic trumpeter Tine Thing Helseth turned the Edvard Munch Museum in her native Oslo into a hub for classical music, thanks to the inaugural Tine@Munch festival. Here she is performing with fellow Norwegian, the legendary pianist Leif Ove Andsnes. The two collaborated on Hindemith's Trumpet Sonata. Playing in the beautiful surroundings of the Munch Museum, it's violinist Nicola Benedetti. Charlie Siem, Nicola Benedetti and Gunnar Flagstad at the Tine@Munch festival. Trumpeter Tine Thing Helseth plays at her own Tine@Munch festival. Tine herself was present every step of the way, giving insight into each piece and into the life of Edvard Munch, whose incredible paintings made an imposing backdrop for the main concert hall. Also appearing several times across the three-day festival was violinist Charlie Siem, who gave a particularly spectacular reading of Maurice Ravel's 'Tzigane'. Part of the Tine@Munch festival included informal late-night concerts, where all the performers returned to tackle some slightly different repertoire, including hoe-downs and Beach Boys songs. Cellist Truls Mork plays Cesar Franck's Cello Sonata during the Tine@Munch festival. Soprano Isa Katharina Gericke performs at the Tine@Munch festival in Oslo. The two violinists share a joke on stage at the Tine@Munch festival. Norwegian pianist and Scottish violinist Nicola Benedetti take their applause after a fantastic Beethoven trio at the Tine@Munch festival. Showing remarkable stamina throughout the whole weekend, Tine Thing Helseth wows the festival audience again. Charlie Siem, Kathryn Stott and Tine Thing Helseth at the Tine@Munch festival. Trading hoe-down licks at the late-night concerts during Tine@Munch festival, it's Charlie Siem and Nicola Benedetti. Ingrid Bjornov and Leif Ove Andsnes share a laugh and a piano stool at a late-night concert during the Tine@Munch festival. The final concert at Tine Thing Helseth's Tine@Munch festival ends in deserved and rapturous applause.